Friday is here and the weather is amazing! Looking forward to a fun weekend with my first baby shower and I cannot wait! I have already received some gifts and it just makes it so real. I can’t believe in a little over a month, I will be a mom. I am hoping the showers and finishing the baby room keeps me distracted, otherwise these last weeks may get long. 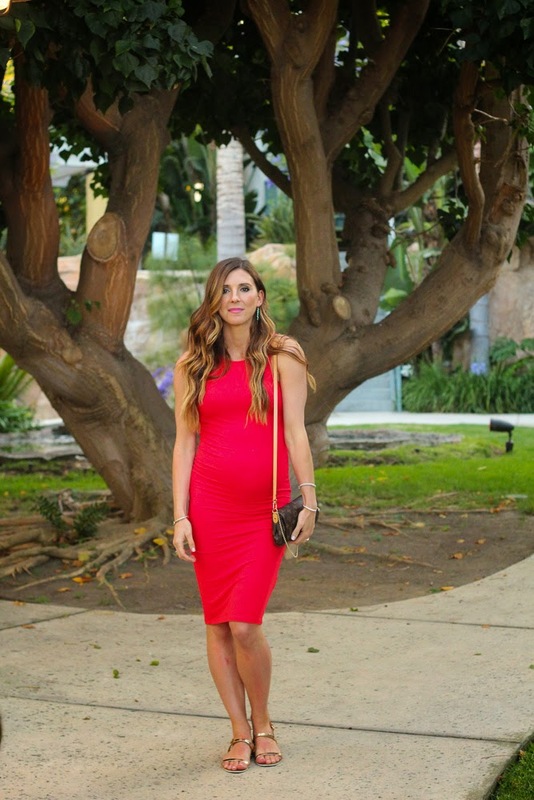 Today, I am sharing a look from last weekend’s baby moon. I found this dress in the “basics” section at Forever 21 for under $15! It’s super stretchy and soft and thought it would be perfect for a night out. I have been wearing a lot of flats lately, especially on this trip because we did so much walking. These gold flats are still dressy enough to pair with a dress like this. Hope you all have a great weekend and as always, thank you so much for reading! brilliant colors! I am so happy your found those blossoms to take pictures with, they match the dress beautifully. Gorgeous photos! That red dress looks amazing on you! You are the prettiest pregnant woman ever! I love this dress on you. I hope you had a great weekend and a wonderful shower!